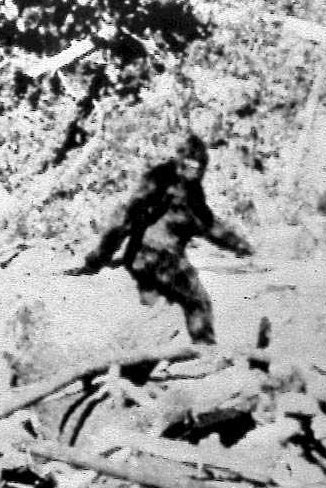 Near the village of Edmore, southwest of Mount Pleasant, a huge creature haunts homes and people, says one resident. After learning Animal Planet's "Finding Bigfoot" crew came to Gladwin, Houghton Lake and West Branch this week to seek out the mysterious, hairy ape, Tammy Forrester asked why the film crews aren't coming to her neighborhood. "There is something in these woods," she said. "There's a lot of things that go on around here with this thing." She said her family and neighbors have seen Bigfoot for about 15 years. Forrester saw it crouched down in her yard a few years ago. "It came up and knocked a fan out of our bedroom window. Seriously," she said. "It was a whole lot bigger than me." The creature, she said, makes bizarre noises that make the hairs on the back of her neck stand up. It also has a musty, moldy smell. That's how people know he's around, she said. When that happens, Forrester said, she heads indoors. Dogs are scared of it, she said, including the family beagle, who would hide when he heard it. "People out here dont walk these roads after dark," she said.